DrivethruL is an independent driving school based in Docklands, providing driving tuition throughout the East London area. According to their website and social media profiles, their driving instructors are fully qualified and provide both manual and automatic driivng lessons. Their website has several guides on a range of topics. You can find information on everything from how to apply for your provisional license, to the show me tell me questions asked during the driving test. You can save money on your driving lessons with DrivethruL’s refer a friend scheme. The driving school offers free lessons when you refer a friend and taking advantage of this can reduce your overall costs. There are no discounts available to NHS staff members, students or the unemployed. The DrivethruL website contains links to a free online mock theory test which can be used by both students and non students alike. If you are studying for your theory test, these online questions can help with your preparation. They also have information and advice on how to pass the driving test and this can be found here. DriveThruL are well rated and they have a number of positive reviews. Their main review profile on Google has a 4.9 out of 5 rating based on 39 ratings. Based on the comments left on this page, Abdul and Siddiqur are two of their highest rated instructors and they are worth seeking out if you want to learn to drive with the school. They also respond to issues mentioned in reviews and this is a sign of a professional driving school. They have an active Facebook page and this is another sign of a modern driving school. Their Facebook page has over 1,500 likes and over 1,100 people following it. The company has 16 reviews on this page, as well as pictures of students who have just passed their driving test with them. You can also find videos on their profile, highlighting some of the common pitfalls you need to look out for on the day of your driving test. The video is has some great tips and advice in it and it is worth watching for anyone close to taking their driving test. 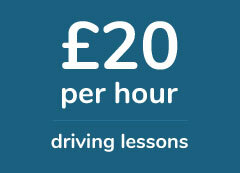 DriveThruL’s introductory offers are very competitive and the offer of 2 driving lessons for £15 is good value for money. If you want to book your driving lessons online, you can do so via Paypal on DriveThruL’s payment page. Booked 30 automatic driving lessons. I struggled with a manual so switched half way through. DriveThruL were really accommodating as I needed two different driving instructors. I was with another driving school in East London and DriveThruL were definitely the better choice. Great customer service and they're really easy to deal with. Booked my test at short notice and they were able to fit the lessons around my work commitments. Passed and had all my lessons in a 3 week period. DriveThruL were great! Helped me get my head around parking and changing lanes because I found both very difficult. I got on well with my driving instructor, a friendly guy and he's laid back. We worked well together and I'm glad I passed.